This 21st of March 2011, Far East Movement is bringing the party to Manila! 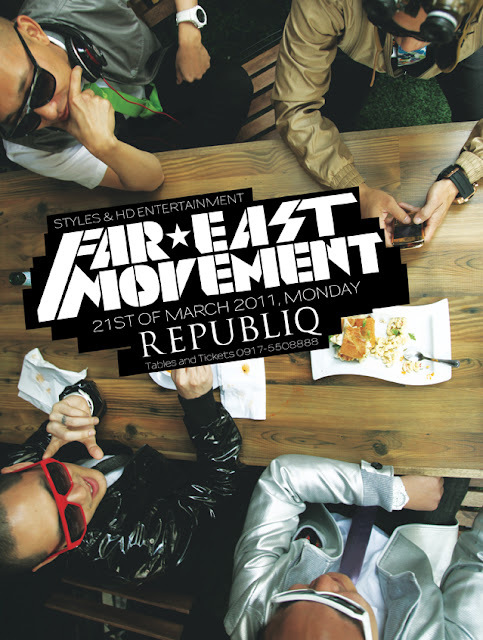 The first American-Asian group to land on mainstream pop charts, FM's Kev Nish, Prohgress, J-Splif, and DJ Virman will be rockin' their stylish shades, skinny ties, fresh kicks, and shiny blazers at Republiq Club in a live performance featuring hits like "Like a G6", "Girls on the Dancefloor", "Rocketeer", and "Don't Look Now". This is one big party you wouldn't want to miss out on! Get your tables and tickets by calling up this number 09175508888 or log-on to the Republiq website.